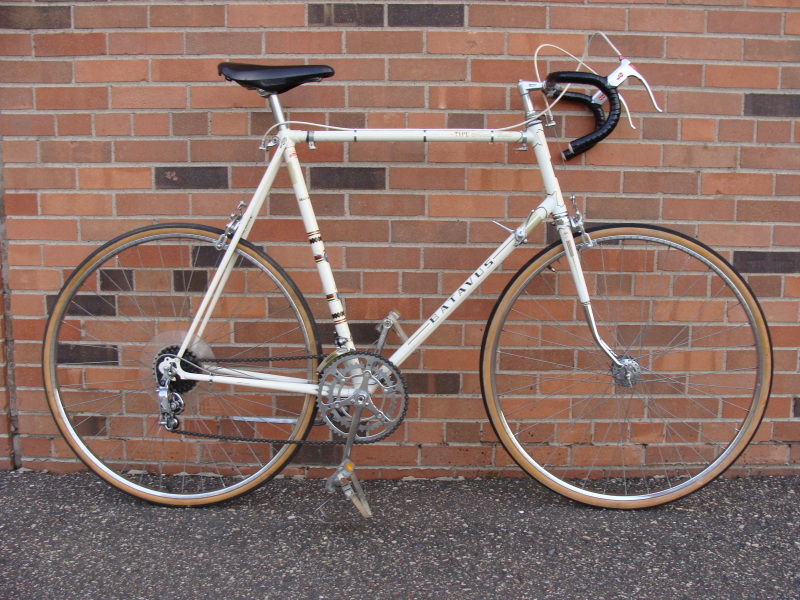 Hi My name is Steve and this is my best Craigslist find yet, It’s an early 70’s Batavus Type Monte Carlo road bike. I’ve seen a few other Batavus bikes around but never one like this. 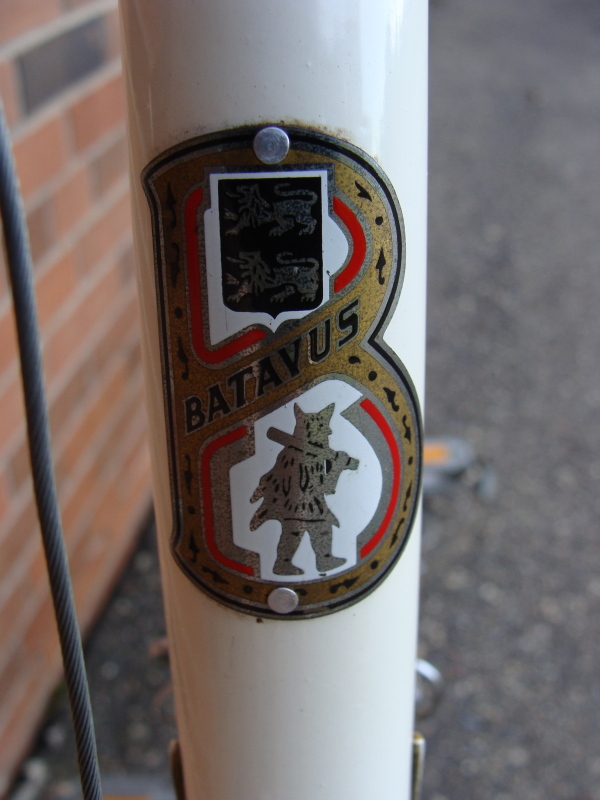 In case anyone is curious Batavus is a very old bike builder in Holland, I’ve had a hard time finding out much about these bikes and although they aren’t real high end bikes they’re really cool (I think anyways). I bought this from the original owner who had it hanging in his garage for the last 20+ years, as far as I can tell it’s virtually 100% original other than tires. It’s in amazing condition and just needed greasing and air in the tires although the front tire is a bit sketchy. 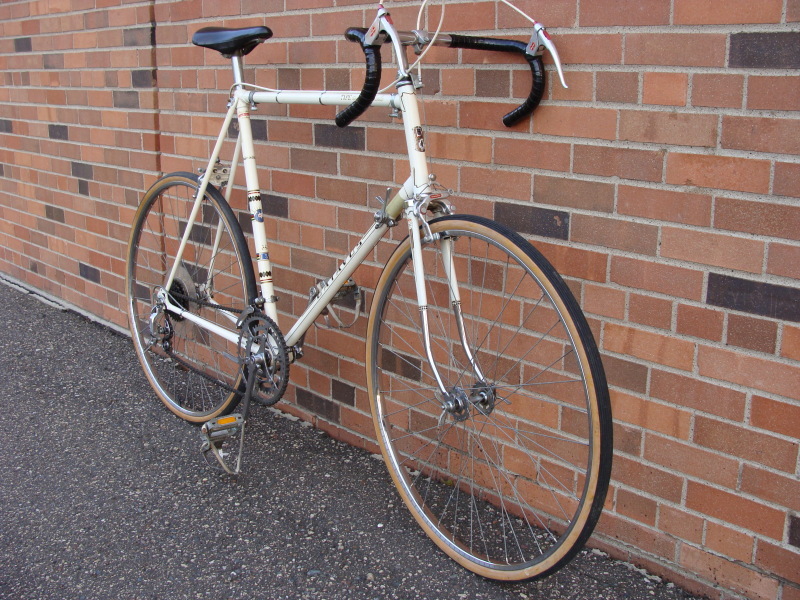 It’s got Altenburger brakes, Huret derailleurs, original leather toe straps, Grand Prix seat (it’s like a plastic/rubber Brooks B-17) and the bar wrap is even original although every Batavus I’ve seen has the same wrap so it must be amazingly tough. The best part is it’s got a standover height of 35 1/2 inches and a 22″ top bar so it fits me and my 6’6″ frame perfectly. I also bought his wifes bike which I’ll send in soon. Steve. Nice bike! I would love to be a member of this forum but there is no place to “Register”. I can “Log In”, no! Wait! I’m not “Registered”! Any assistance you can give to me would be greatly appreciated. I started to “rescue” old ten speeds, etc. Bill, you aren’t required to register in order to comment, your first comment under using a unique email address is held in a pending state until i approve it. Any comments using the same email thereafter will post immediately. If you do care to register, email me via the address on the “Submit an Old Ten Speed” page and I will be happy to register you as a user. Thanks Steve, I appreciate your quick reply. I just picked up, “rescued”, a Windsor Carrera Sport and a girls Fugi Gran Sport. Thanks again. I can’t wait to spend some time on this site. Thanks guys, I actually ended up selling that one, I wish I had the funds to keep a large collection but I just don’t so I buy and sell and keep an everchanging fleet with one or two keepers in it. I did buy the guys wifes Batavus and I’ll submit that soon, my 12 year old son worked it off and owns it now and I just picked up a gorgeous Gitane Tour de France that just needs fresh pics for submission. 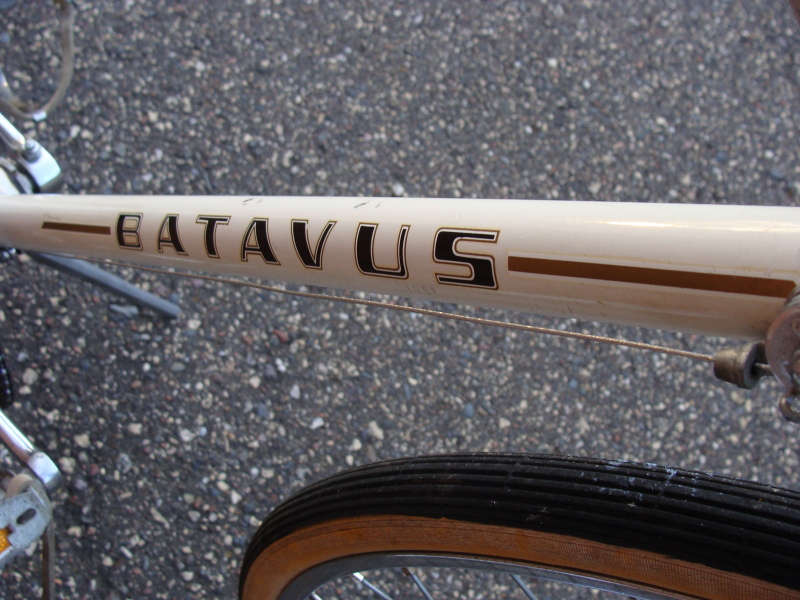 That’s a nice, old Batavus, Steve! It’s great to see an OTS survive the decades in such good condition! 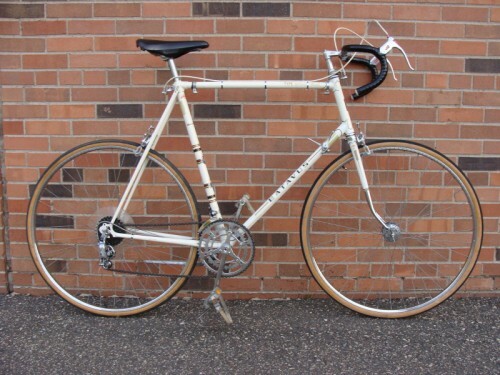 You’re fortunate to find quality old bikes, and other folks who value them enough to buy them. Keep up the good work! Nice one! 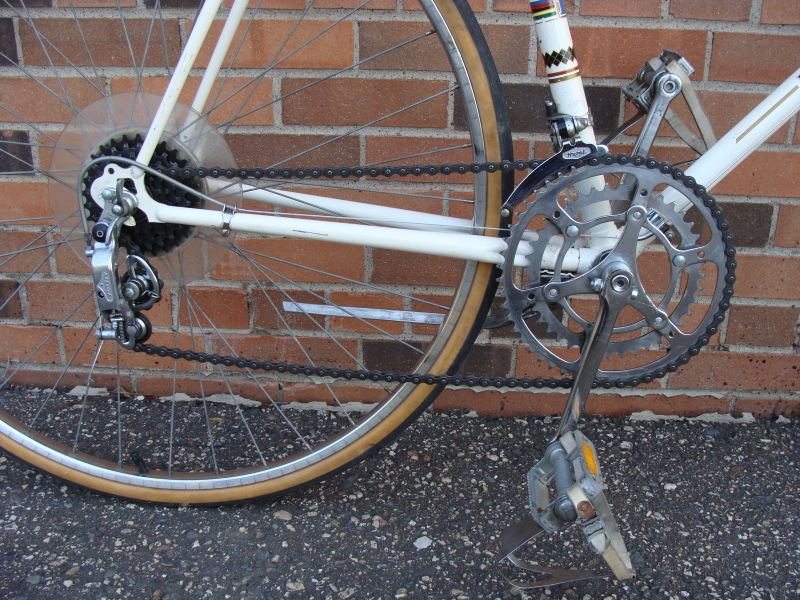 I have brake levers just like that on my current commuter. They came from my early 70’s Raleigh Record. I have one just like yours, except mine is burgandy and the front fork has been replaced. I bought mine used for my 15th birthday. It’s hanging in the garage and ready to ride! I have kept it indoors and well maintained these 31 years now, and I love it. For me, it has memories (and scratches, bumps, bruises) that can’t begin to reflect all the wonderful miles I’ve spent on it. I have a high end Grant road bike, but I never feel 16, 24, 33 or even 41 years old on it. It makes me smile every time I ride it. Don’t know if this forum is still going. Just picked up one of these bikes on the side of the road being tossed out. In excellent condition. Needs are in tires and a little cleaning. Paint is immaculate under a light layer of dust. Also picked up a Dr. Pepper and a ZX Power Climber Mountain Bike, all in excellent condition, few if any scratches, not that I have seen so far, and all put out to be picked up by the local trash. I will be doing checks every year for bikes now….